PHOTO COURTESY WALT DISNEY PICTURES Armie Hammer and Johnny Depp in "The Lone Ranger." As history demonstrates, the law of the conservation of matter applies magnificently to Hollywood, where nothing, it seems, is ever wasted, lost, or forgotten. The Lone Ranger galloped through decades of radio shows, comic books, television series, and movies, yet returns once again, with his faithful Indian companion Tonto and his white horse Silver, only now in a grand spectacle that belongs with all the other overblown remakes, sequels, prequels, and plagiarisms that populate the cineplexes this summer. In a film season featuring blockbuster versions of "The Wizard of Oz" and "The Great Gatsby," it should come as no surprise that the modest little radio serial becomes one of the showiest and, frankly, silliest movies of the year. Apparently in the interests of political correctness or appeasing the sensibilities of Native Americans understandably resentful of their treatment in both history and cinema, and weary of decades of Caucasians and even African Americans playing Indians, the script turns good old Tonto (Johnny Depp) into an equal partner of John Reid (Armie Hammer), the Lone Ranger. In addition, Depp, who enjoys top billing in the credits, has frequently and unconvincingly advertised some faint connection to some Indian tribe or other, though without specifying if he is a descendant of Geronimo, Sitting Bull, Crazy Horse, or some perhaps less-famous chieftain. The picture unfolds in a retrospective narrative, with the aged Tonto, on display in a Wild West show in 1933, recounting the story to a young boy. Throughout his account the plot moves back and forth in time, with several stories within the primary story providing context and history. That history bears only a vague resemblance to the familiar tale of the masked man who became the hero of a thousand adventures in every popular medium. Filmed all over the West, the film magically moves fabled Monument Valley to Texas in 1869 as the transcontinental railroad, also moved magically to Texas, nears completion. A gang of outlaws attacks the train itself, which carries John Reid, a young prosecutor, and two prisoners, Tonto and the gang's leader, a vicious murderer named Butch Cavendish (William Fichtner). The trio of Reid, Tonto, and Cavendish carry on a series of pursuits, ambushes, and gunfights throughout this very long movie. Just about every element of the picture from that point onward grows increasingly violent and extreme, sometimes leading to horror, sometimes to humor. Cavendish, for example, even disgusts his gang of thugs when he cuts out the heart of one of his living victims and devours it. On the other hand the script portrays Reid as a dumb, incompetent, straitlaced, naïve buffoon, guided and frequently rescued by the sly, clever, sardonic Tonto, who gets all the laughs. Repeating itself over and over, the film shows the Ranger and his sidekick constantly landing in trouble and escaping through luck or subterfuge or the assistance of the "spirit horse," a wonderful white beast who of course becomes the famous Silver. 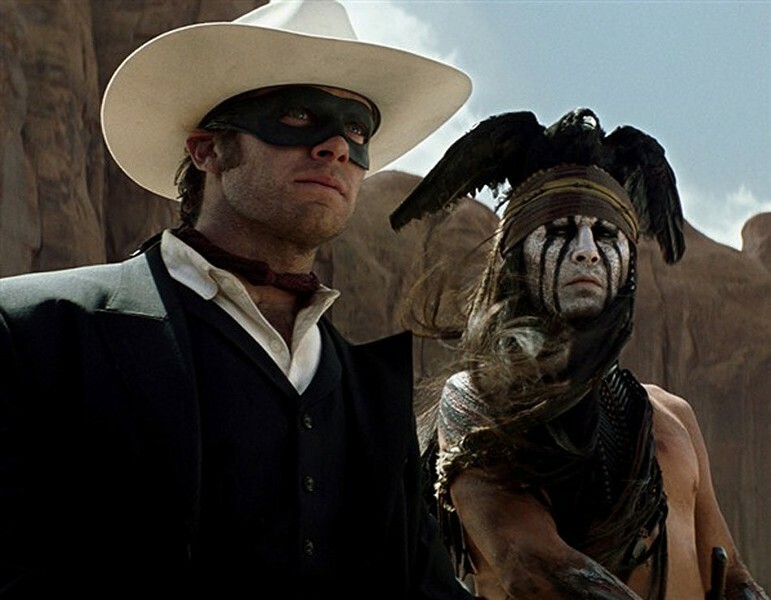 In the process, John Reid actually grows into the role of the Lone Ranger, which as a man of peace he had resisted despite the villainy he and Tonto confront. The stirring climax of the picture, which goes on interminably, features dozens of remarkable stunts involving two separate trains, the Ranger riding Silver across the roofs of a whole string of railroad cars, an exploding trestle, a tremendous wreck, and of course, numerous slugfests and gun fights. The credits list over a thousand people, hundreds of them digital artists who create all those amazing effects, which indicates just how far the concept has traveled from the great days of the "William Tell" overture and the ringing voice of Clayton Moore, television's original Ranger. Although it contains some traditional Western themes and devices — Native Americans, outlaws, railroads, train and bank robberies, the memory of the Civil War — the movie plays many of them for laughs and exaggerates the others beyond plausibility. The actors, including the trio of Depp, Hammer, and Fichtner, play their characters on one dull, repetitive note. The dumb comedy conflicts with the attempts at serious action and a running gag about the Ranger's mask undercuts any of the romance of the original hero. Hiyo Silver, go away!